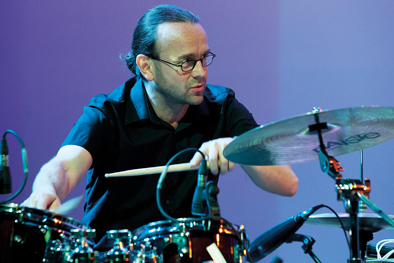 Jazzfestival Schaffhausen, May 22, 2013, by Martin Pearson for SRF Schweizer Radio und Fernsehen. Mixed and mastered July 8, 9, 2013, by Willy Strehler at Studio Klangdach. Photos: Cees van de Ven. Liner notes: Manfred Papst. 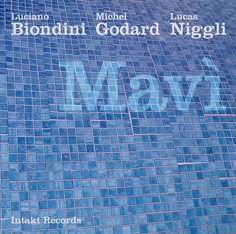 «Mavì» heisst die neue CD des Trios Biondini-Godard-Niggli. Der Titel bezeichnet ein klares Blau – jene Farbe, die man sieht, wenn man die Erde vom All aus betrachtet. Und er sagt viel über die Klänge, die uns da beschert werden. Wir hören Musik, die aus den Sphären zu kommen scheint und doch höchst welthaltig, bewegt und sinnlich ist. 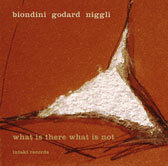 Da ist die Herkunft der Musiker: Biondini (*1971) stammt aus Spoleto in der italienischen Provinz Perugia, Michel Godard (*1960) kommt aus dem französischen Héricourt bei Belfort in der Franche-Compté, und Lucas Niggli (*1968) ist Schweizer und im Zürcher Oberland daheim, verbrachte aber die ersten sieben Lebensjahre in Kamerun. Verschiedene Kulturen und Sprachen kommen hier also zusammen. Die Musik von Biondini, Godard und Niggli lebt von ihrer Poesie, ihrer Klangschönheit, ihrer Gedankentiefe, aber auch von ihrer inneren Spannung. Diese entsteht durch das Verweben von Komposition und Improvisation. So gelingt ihnen jene Verbindung von Form und Freiheit, die den Kern des Jazz ausmacht, und wir sehen die Erde in klarem Blau. Mavì is the title of the Biondini-Godard-Niggli trio's new CD. It refers to a clear blue, the colour seen when looking at the earth from outer space. And it says a lot about the sounds it offers us. We hear music which seems to emanate from the spheres while remaining wholly worldly, emotional and sensual. The trio formed by Luciano Biondini, Michel Godard and Lucas Niggli is unusual in various senses. 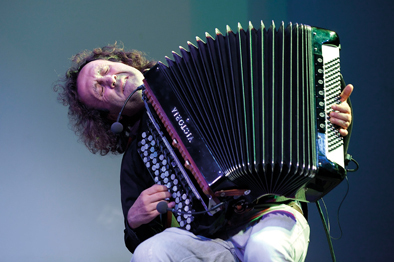 Firstly the musicians' nationalities: Biondini (born 1971) comes from Spoleto in the Italian province of Perugia, Michel Godard (born 1960) comes from Héricourt near Belfort in the Franche-Comté in France, and Lucas Niggli (born 1968) is Swiss, a native of the Zürich Oberland who spent the first seven years of his life in Cameroon. So this is a meeting of various cultures and languages. A further particularity of the trio is its instrumental make-up. 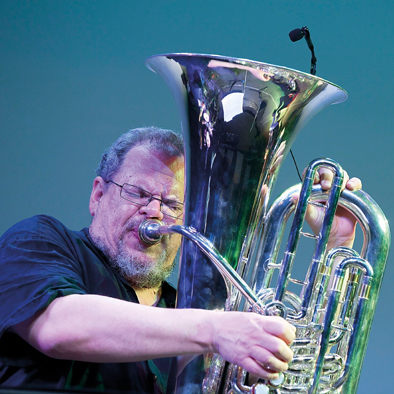 Biondini plays the accordion, Niggli the drums and all manner of percussion instruments; Michel Godard plays the tuba and the serpent – an ancient, serpentine wind instrument with a mouthpiece like a brass instrument but side holes like a woodwind instrument. Sometimes Godard also takes up the bass guitar. Thanks to this highly individual and fascinating instrumental arsenal the trio has a truly spectral palette of sounds at their disposal. The music of Biondini, Godard and Niggli thrives on its poetry, the beauty of its sounds, the depth of its ideas, and also on its tension. This is generated by the weave between composition and improvisation. Which is how they succeed in making that connection be-tween form and freedom which constitutes the core of jazz. We see the earth, clear and blue.